ObjCList - This is a simple template class used to hold various lists of decls etc, which is heavily used by the ObjC front-end. This only use case this supports is setting the list all at once and then reading elements out of it. Definition at line 82 of file DeclObjC.h. Definition at line 88 of file DeclObjC.h. Definition at line 90 of file DeclObjC.h. 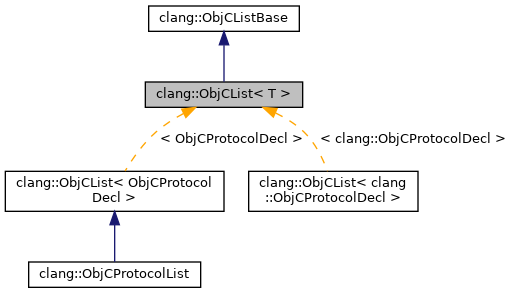 Referenced by clang::Sema::CheckForwardProtocolDeclarationForCircularDependency(), hasObjCExceptionAttribute(), and clang::ObjCCategoryDecl::protocol_begin(). Definition at line 91 of file DeclObjC.h. 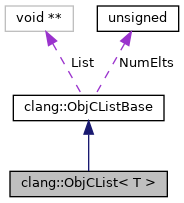 Referenced by clang::Sema::CheckForwardProtocolDeclarationForCircularDependency(), hasObjCExceptionAttribute(), and clang::ObjCCategoryDecl::protocol_end(). Definition at line 93 of file DeclObjC.h. Definition at line 84 of file DeclObjC.h.